On December 26th, CNN aired this story, which also appeared on TV stations throughout Florida and in New England. It leads with the rescue of large loggerhead sea turtles on December 14th by Sue Wieber Nourse and Rufus the Turtle Dog from Truro’s bayside beaches. 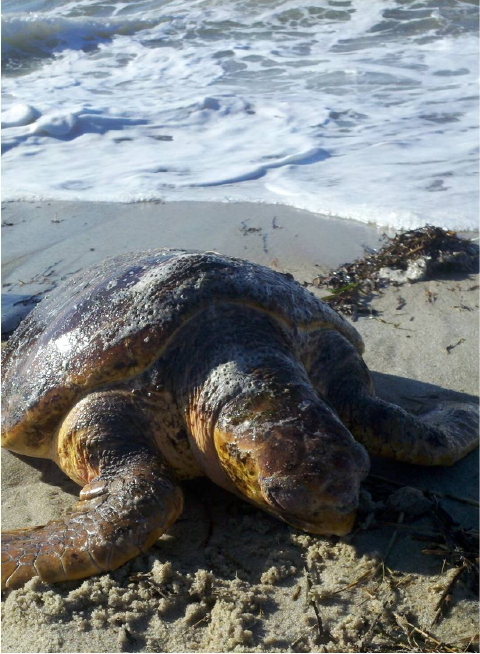 See Turtle Journal Rescues Three 50+ Pound Loggerheads on Truro Beaches. Chipping-ice-off-windshield temperature and a blistering wind scouring bayside beaches at 20 knots, these represent perfect conditions in mid-December to find semi-tropical loggerhead sea turtles stranded on Cape Cod. The bay was white-capped and frothy; breakers, swelled by a new moon high tide, devoured the beach and ate into the toe of the dunes. Yep. 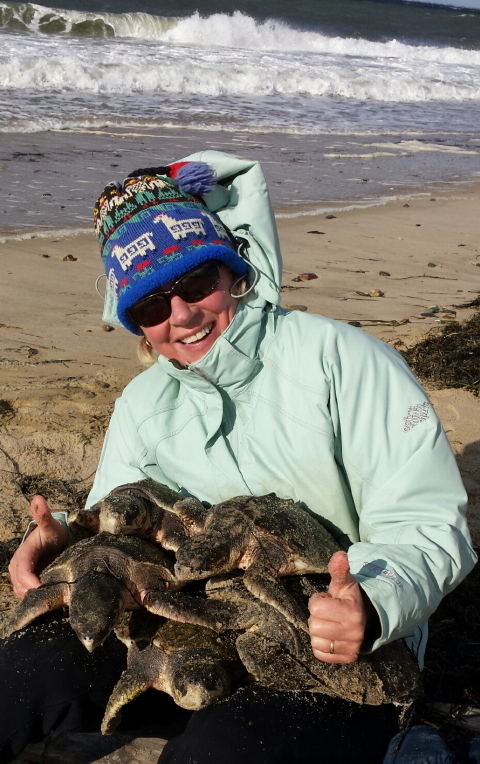 Couldn’t be better to rescue the remaining live loggerheads trapped in Cape Cod Bay by frigid water temperatures. With a west southwesterly blow, Turtle Journal calculated that turtles would most likely be found at Ryder and Fisher Beaches in Truro. So, off sped Sue Wieber Nourse and Rufus the Turtle Dog to greet the noonish tide in search of troubled loggerheads. 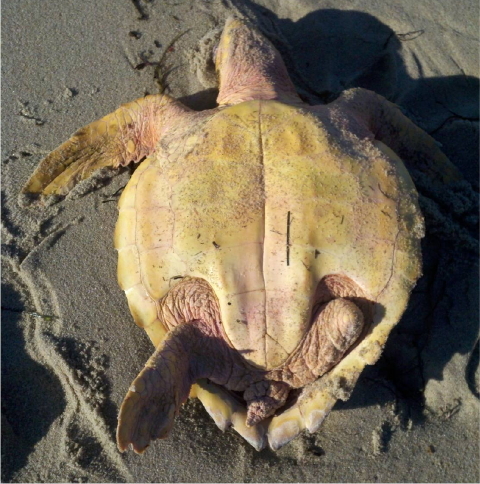 South of Ryder Landiing, they spotted the carapace of a loggerhead sea turtle swamped by pounding surf, the helpless animal submerged beneath the waves. 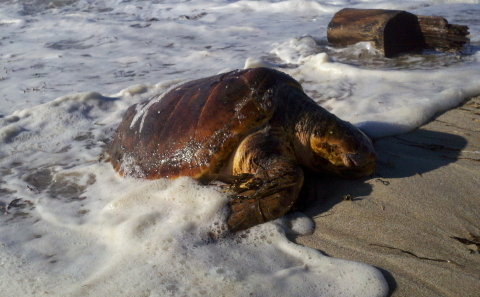 Sue dashed into the near freezing water and dragged this 50+ pound loggerhead to safety. With the tide still rising, she lugged the critter higher and higher up the disappearing beach, no easy feat even with Rufus barking encouragement and supervising the rescue operation. When your back’s aching and toes are frozen numb, it’s hard to realize that these heavy, cumbersome turtles are actually still young juveniles who will quintuple their mass, at least, before reaching sexual maturity. Thank the gods of nature that this cold-stunning process is a one time shot for loggerheads as they sow their wild juvenile oats. Rescuing 50 or 60 several hundred pound, dead weight, cold-stunned loggerheads a year would literally and figuratively break our backs. It’s tough enough when they hit the scales in the 50 to 100 pound range! 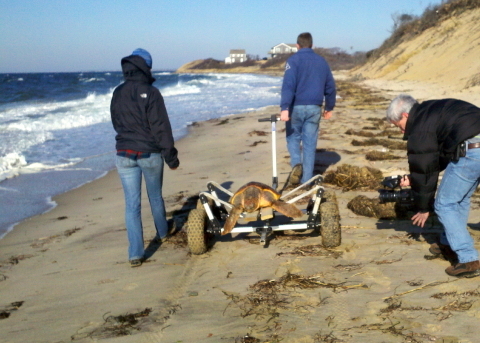 The Wellfleet Bay Wildlife Sanctuary was called to recover the loggerhead with its turtle cart. Sue covered the animal with dry seaweed to prevent any additional hyperthermia, and continued her patrol along the beach. 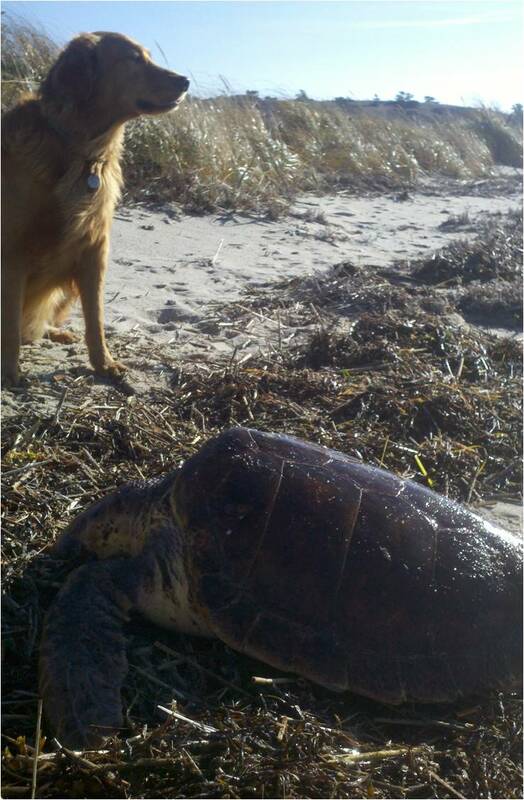 Within a few hundred feet, she and Rufus discovered a second 50+ pound loggerhead and dragged it far above the high water mark. When the sanctuary team arrived, they were accompanied by a CNN photo-journalist to document the cold-stunning turtle rescue process. He interviewed Sue on camera for about five minutes to capture the inside story on sea turtle rescues in the Great White North. With the recovery team and the photo-journalist gone, Sue and Rufus hopped in the car and headed north to the next landing at Fisher Beach. We calculated that with two loggerheads at Ryder, there was a strong possibility of another along this west facing shoreline. Sure enough, about a half mile south of Fisher, they found a third 50+ pound, cold-stunned loggerhead. 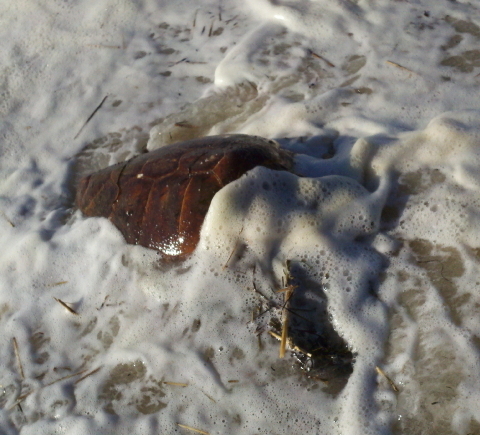 Like the first two, this loggerhead was still alive. While examining the specimen, Sue discovered that it had a missing (and healed) left rear flipper. We called the Sanctuary again and Dennis Murley, a valued friend and colleage of many years, zipped up Route 6 to Truro with the turtle cart to speed this sea turtle to treatment. Loggerhead sea turtles, even these “juveniles,” are massive and powerful animals. Despite their cold stunned state, they can inflict quite a bruise when they swing their flippers. We liken them to tanks, for when left overnight in dry dock, they have been known to turn over every piece of furniture in the room. You get a sense of their massive frame in comparison to 80 pound Rufus standing guard as she waits for the recovery team to arrive. 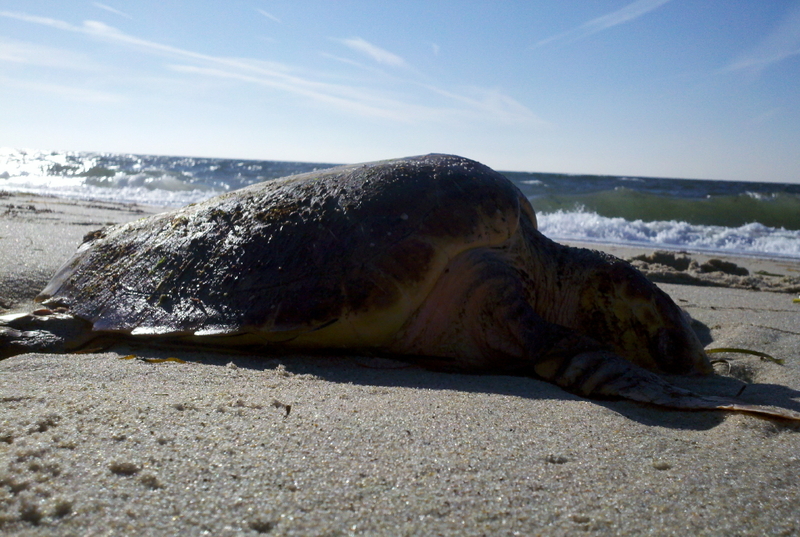 Finding three LIVE cold-stunned loggerheads on a mid-December day is a special and memorable event. Congratulations to Sue Wieber Nourse and Rufus, turtle rescuers extraordinaire! You are currently browsing the Turtle Journal blog archives for December, 2012.